Welcome to the worlds greatest guide to Women's Oxford Pumps. Are you actually looking for Women's Oxford Pumps? Well, we hope you are because the reality is that you have found our Women's Oxford Pumps page. In this women's clothing section of the Apparel Search directory, you will find all sorts of interesting information regarding Women's Oxford Pumps. Apparel Search is a leading guide to fashion, style, clothing, glam and all things relevant to apparel. We hope that you find this Women's Oxford Pumps page to be helpful. Women's pumps exclusively refers to women's shoes with a kitten or higher heel. Pumps can be made from from a wide variety of footwear materials. Pumps are commonly worn with a suit or dress pants, but are also worn with dresses, skirts, trousers, and jeans. An Oxford shoe is characterized by shoelace eyelets tabs that are attached under the vamp, a feature termed "closed lacing". Originally, Oxfords were plain, formal shoes, made of leather but they evolved into a range of styles suitable for both formal and casual wear. Oxfords are now made from a variety of materials, including calf leather, faux and genuine patent leather, suede, and canvas. They are common in black or brown, and may be plain or patterned (Brogue). 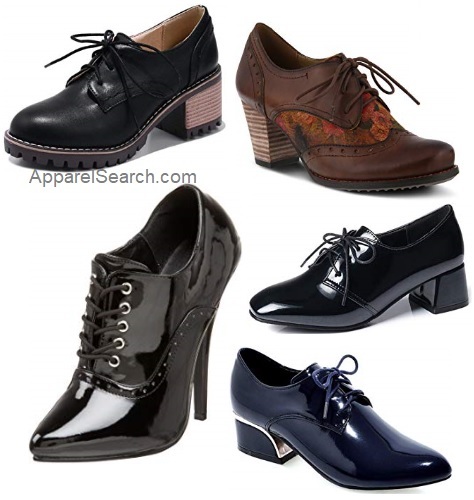 Women's oxfords can come in a wide variety of colors, but traditionally they are black or brown. Women's oxford pumps are oxfords with a kitten or higher heel. What ever you are wearing on your feet, is in fashion. If you want to be even more stylish, you should wear your favorite Women's Oxford Pumps.